I got a dog! Actually, she's a four-legged exercise machine. It's the first exercise machine I've ever had that works for me. Well, so far. This is Maggie. 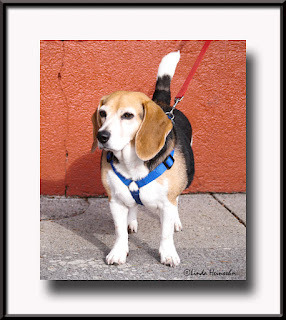 She's a 10-year-old purebred miniature beagle. She stands about 11" at the shoulder and, as you can see, could stand to lose a few pounds, just like me. She's very smart, well adjusted, snores, announces her beagle self to every cat she meets, and thinks humans need to come down to her level if they want to play with her. How cute! What a sweetie! Cute dog! Have fun with her! Thanks, Carrie and Judy! This is her too cool for school pose. She definitely didn't like being held up from sniffing out scents. That is one gorgeous little girl!! I'm so very happy you have her. Thanks for sharing pics such as this. Maggie is one lucky little lady! We miss her but know she is in good hands. Thank goodness! Thanks Ashley, Trenton and Jordan! Have you seen the other photo of her that I posted? Ready For My Closeup? She's like a pretty girl who can open any door with a smile! Everyone we pass says, "Cute Doggie!" We're very lucky to have her. Thank you very much!